<h2>Monster Cookie Bark — Monster Cookies in Bark Form</h2> Back in October, before cookie season really started, I posted a recipe for Brownie Bark. If you haven’t tried it and are in the midst of holiday baking, it’s really good! Since posting, I’ve made it a couple of times for myself and for friends. I also created a super easy (but not quick — it takes an hour to bake) peanut butter version inspired by Monster Cookies called Monster Cookie Bark. Monster Cookie Bark requires one mixing bowl and a spoon, so you don’t have to bother with an electric mixer (Hooray!). I used regular colored M&Ms because that’s all I had in the pantry, but if you want to spruce it up for the holidays you could use the red & green ones. Also, my favorite monster dough contains a little flour (some don’t), but since it only contains a small amount, you might be able to replace it with 1.5 weigh ounces of your favorite gluten-free baking mix to make it gluten free. Or try a mixture of rice flour and tapioca. If you’re a gluten free baker, you probably already have some ideas. If you try it, let me know how it goes since this is a new recipe. I think I like it better than actual Monsters! 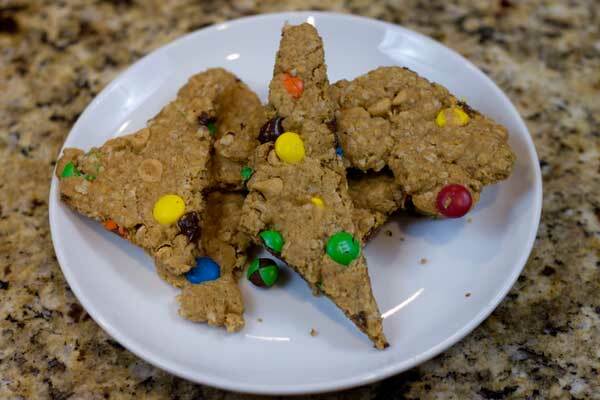 Monster Cookie Bark is an Oatmeal peanut butter cookies with candy coated milk chocolate formed like a cookie bark. Preheat the oven to 250 degrees F. Line two large (about 13x18), rimmed, heavy duty baking sheets with nonstick foil. Parchment is probably okay too, but I've been using nonstick foil. In a large mixing bowl, stir together the eggs, both types of sugar, baking soda, salt, corn syrup and vanilla. Stir in the peanut butter and melted butter. When mixed, add flour and stir until blended. Lastly, stir in the oats, all the different chips and the candies. Empty onto the two baking sheets and divide dough on each sheet into two sections/ Dampen fingers and press each section to make two very thin slabs on each cookie sheet. You could make one big slab on each sheet, but making two gives you more edge pieces, and those are the best! Bake one sheet at a time at 250 degrees for 45 minutes (total bake time will be an hour). Remove from the oven and run a pizza cutter through the slabs to make big and little triangles – do not separate at this point. Return to the 250 oven and bake for another 15 to 20 minutes. Let cool for about 10 minutes on baking sheet and carefully transfer to a wire rack to cool completely. It should crisp as it cools. If you have some thicker pieces that aren't crunchy enough for you even after they are completely cool, throw them back in the 250 oven for another 10-15 minutes, then let cool. The thinner you press the slabs, the better chance you have of getting crunchy bark. I used quick oats as opposed to regular or old fashioned. I usually used old fashioned in cookies, but in this recipe I liked the fact that the cut oats blended into the cookie and made it taste less oat-y. Finally got around to making these and it was worth the wait, but then why didn’t I try them sooner!! Thanks Anna, for another great cookie recipe (my fav. is still the brownie bark). I followed the recipe to the letter except did a mix of PB chips, Chocolate chips, and mini M & M’s. Baking time was spot on and the results are delicious! I’m wondering if I could use the cherry cordial m&m’s I have sitting on my counter? PB&J monster bark maybe? These are soooo good. Taste like the best crunchy peanut butter/oatmeal cookies you’ve ever had. Instead of M&Ms I used mini semi-sweet chips & sprinkled the top with holiday sprinkles – tiny trees & dots. Adorable & so festive. Thanks Anna, I will be making this over the holiday with my visiting nephews. Perfect for them to help me with and enjoy! Anna, yet again another hit! I am stuck on pumpkin-flavored goodies still and make your pumpkin cream-cheese swirl bars all the time. Since you posted the brownie bark, I have now seen it in packages at Walmart. Must be the new craze. I love the idea and would probably try the brownie one first. “Bark Cookies” are something I learned about from you in the past few months. Do you know if they were called something else prior to this or are they a new thing? I have the versions in your book on my mental radar. I know I’d love this version!! I am so in the bark making mood lately. Might have to give this one a go. Thanks for trying the Brownie Bark, Karen! I am so going to try this recipe. I just made your brownie bark this week to use up some egg whites and it is so yummy. This looks even more decadent.